Hero Up for Children's Cancer will be held Sept. 2 at Cook Park. This is its fifth year. In September 2013, and every September since, an event called Hero Up for Children's Cancer honored Keith's memory — by raising money for research into treating and curing cancer in children. 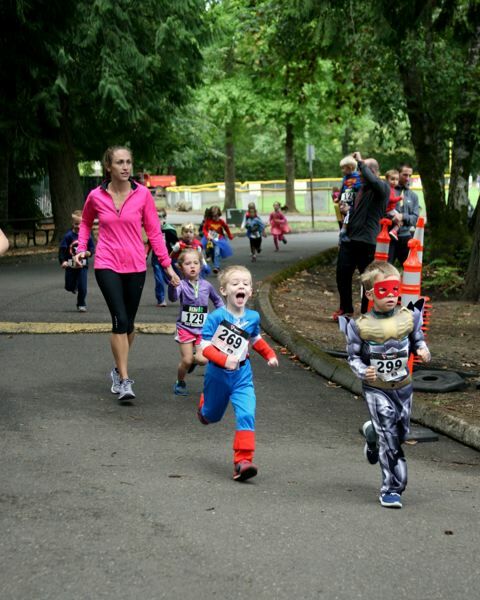 This year's Hero Up races are coming up Saturday, Sept. 2, at Cook Park. They include a half-marathon starting at 7:30 a.m., a 5K run starting at 8:30 a.m. and a kids' race starting at 10 a.m.
Darcee Burnett said she began Hero Up in the year after her son's death because she didn't just want to be "sitting around," in her words, as she coped with her grief. "I just needed something to do … that felt like it was something worthwhile," Burnett said. Burnett is proud to say that Hero Up is a true nonprofit event. "We don't make any money on it," she said. "A hundred percent of what we make (in net proceeds) goes to research." Hero Up supports Doernbecher Children's Hospital, where Keith was treated for his brain tumor, as well as the lesser-known Children's Cancer Therapy Development Institute in Beaverton. Burnett said that after Keith's death, the family chose to donate his brain tumor cells to Dr. Charles Keller's lab at Doernbecher. Keller has since left the hospital to found the Beaverton cancer institute. "We feel like we want to support both of them, and they are both doing really, really awesome work," Burnett said. In the nearly five years that have passed since Keith's death, organizing Hero Up has given Burnett "a lot more meaning and purpose to how I spend my time since his passing," she said. "It's just been very therapeutic for me," said Burnett. "That's really why I started doing it." The event has given those who know the family an outlet as well, she suggested. "People want to help when they see people go through difficult things," Burnett said. I feel like it's given people an opportunity to help in a really positive way." Registration for the half-marathon is $70 through Thursday, Aug. 31, or $75 on the day of the race. 5K registration is $35 through Friday, Sept. 1, or $40 on race day. There is no set charge for the kids' race, although Burnett said families with children participating are asked to bring donations. "We ask that people bring new pajamas or toys or some sort of monetary donation for their kids, which we donate to the hospital," Burnett said. Past races have drawn about 500 adult participants, according to Burnett, and she expects this year's event to exceed that number. Keith's twin brother, now 9, and younger sister attend Durham Elementary School. Burnett said her family has long been going to Cook Park, so to hold the Hero Up event there on the first Saturday of September every year has been especially meaningful for her. "It's just a really fun community event," Burnett added. "Everybody that comes talks about just the great feeling that's there."